Images of US Marines, and agents from the Drug Enforcement Agency and Afghan National Interdiction Unit raid narcotics labs in Afghanistan’s Nimruz province as part of an effort to interdict heroin trafficking. — US Marines and agents from the Drug Enforcement Agency and Afghan National Interdiction Unit, raid narcotics labs in Afghanistan’s Nimruz province as part of an effort to combat the heroin trade. LOOK AT THIS LITTLE KINGPIN. Sarah Jane Smith is not amused. Today is the tenth anniversary of the death of my friend Ronnie Frye. He was poisoned to death in the middle of the night by the government of the State of North Carolina, on behalf of its citizens, in revenge for the 1993 murder of Ralph Childress. I met Ronnie in the last year of his life; he was in his eighth year on death row when the lawyers who were handling his appeals asked me to meet with him and maybe, depending on how things went, to help them with a campaign to influence the governor’s decision about whether or not to commute his sentence to life imprisonment. I’d never done anything like this before. I was in my second year of graduate school and had just begun work as a teaching assistant for a class on human rights that had a service learning component; one of my tasks was to accompany a few students who’d signed up to meet with local death penalty attorneys. Before the end of that first meeting, I found myself agreeing to go along with everyone to the prison in Raleigh and to meet one-on-one with Frye … just to get to know him. I knew that I was opposed to the death penalty, but only in an academic sort of way. I’d grown up in Michigan, which abolished the death penalty in 1846, and in Canada, which abolished it in 1977. Although I had done a lot of work with Amnesty International by this point in my life, I didn’t really have any first-hand experience with human rights issues. I was just a letter-writer and the organizer of an occasional rally. When I moved to Durham, North Carolina in 1999, I learned that executions took place at a prison in nearby Raleigh and I went to my first late-night protest vigil that Fall where I met a group of amazing people who plugged me into a state- and nation-wide network of human rights activists. That said, I’d never been inside a prison and I’d never spoken to a prisoner. I had no idea what to expect when I walked into the visitation area and sat down across from a death row inmate. The whole thing couldn’t have seemed more surreal. I’d attended private schools until I was seventeen years old, graduated from college with two bachelor’s degrees, and was actually being paid to work on a PhD in political philosophy at Duke University. And Ronnie was a recovering crack addict from the mountains of North Carolina who admitted to murdering his landlord with a pair of scissors. I was scared of him before they brought him down to meet me that first time. I’d looked up Frye online and found a picture of him; it must have been his intake picture from back in 1993: he had long, dirty hair and a beard; I told everyone who asked me about my impending prison visit that his eyes looked angry. The guy who sat across from me on that first day in the prison visitation area, though, didn’t look that way at all. He looked the guy in the picture that accompanies this post. After my first meeting with Ronnie, speaking through a little grate and looking through bars and thick glass, we seemed to have enough interest in one another to agree to meet again the following week. Thereafter, I met with him every week for eight months, sometimes for more than two hours at a time. Before I left, every time, he’d put his hand against the glass and I’d do the same; it was the only way to shake hands. My first act of activism on Ronnie’s behalf was to ask prison officials to take a new picture of him for the Department of Corrections website; without too much prodding, they agreed. I knew that if Ronnie did get an execution date, reporters would go there for his picture and the old one would make people feel about him the way that I had; he’d seem like the monster that people want convicted murderers to be, when in fact he seemed to be a decent man who made a series of terrible choices. Over the months that we met, we talked about sports, food, movies, music, politics, and religion. He loved auto racing, about which I knew nothing; he spent month trying to convince me that driving around in a circle is a legitimate sport. He loved the food in the prison cafeteria, but he said it had made him fat. Still he always tried to find ways to get seconds, occasionally getting into trouble for sneaking an extra little carton of milk because the one he got was barely enough milk for an elementary school kid’s lunch. He used to ask me read passages from the Bible and then, the following week, we’d discuss them. I didn’t begrudge him these discussions. His faith was hard-earned and I respected him for it. Though I wasn’t particularly religious myself, I knew a lot about the Bible and enjoyed talking with him about questions and problems that we found. He was open-minded and interested in learning about Judaism and thinking through my lack of interest in organized religion. He wanted very much for me to believe as he did because he’d found a great deal of assistance and comfort in his faith; he thought that I would have a difficult time dealing with his death and he didn’t want me to have to deal with it alone. In this, he treated me the same way that he treated his family members and the lawyers handling his appeals; he sought to protect us and to look after us as much as he possibly could. He’d had only sporadic contact with his family while he was on death row because he knew it was difficult for them to come to Raleigh and difficult for them to visit with him in this situation. But I asked about them (he had a brother, a half-brother, a half-sister, and an aunt), and he eventually told me that his aunt used email. Beyond wanting to get them all back in touch — none of them were letter-writers; I didn’t get a single letter from Ronnie in the eight months of our friendship — his appelate attorneys needed them to explain, likely to the governor, why Ronnie ended up on death row and why his life ought to be spared. 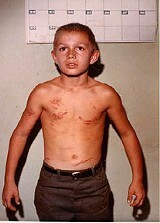 This is a eight-year-old Ronnie in a photo taken by police and later used to train officers about spotting child abuse. The accompanying photo, of his back, has been lost. All you can see are the marks on his torso where the bullwhip with which his foster father routinely beat him came around and stung him in front. Ronnie’s jury never saw the photo because his trial lawyers never found it; they never found it because they never asked about it, even though Ronnie’s foster father went to jail when the abuse was discovered; and they never asked about it because the lawyer responsible for digging into Ronnie’s past was an alcoholic who later admitted to “drinking as many as 12 shots daily before and during Frye’s trial.” At each appeal, judges found that Ronnie’s decision to keep his family out of things — and not his attorney’s drinking — hampered his defense or that the outcome likely would have been the same if both of his court-appointed lawyers had been sober. Of course, jurors disagreed. If they’d known more, two of Ronnie’s jurors said, they’d have voted differently in the penalty phase of the trial. As it became more and more apparent that Ronnie’s execution date of August 31 likely would not be changed by any court, the North Carolina Academy of Trial Lawyers, Amnesty International, the Dean of UNC’s Law School, the President of the North Carolina Bar Association, a former Chief Justice of North Carolina’s Supreme Court, the National Coalition to Abolish the Death Penalty, People of Faith Against the Death Penalty, and the ACLU all petitioned Governor Mike Easley to commute the death sentence. I did too. Ronnie’s family asked me to go along with them to meet with Easley. This was all part of a last-ditch effort when the courts had turned down Ronnie’s appeals. There was a massive media campaign — you can still find a lot of it online if you search — and there were rallies in Hickory and in Raleigh. The last two weeks of it is something of a blur for me as I reflect on it now. I have a vague memory of driving out to Hickory, of talking to a handful of reporters, and of trying to explain to the governor that putting Ronnie to death would be the last in a series of instances where the State of North Carolina had failed him. But my clearest memories are of my one contact visit with Ronnie and of my phone call with him on the night of his execution. One of his lawyers called me, in early August, to tell me that we’d need to make a clemency video. He wondered if I knew anyone with a camera or editing equipment. I didn’t, but I managed to enlist a helpful Duke undergrad who had access to these things. Together, we drove out to the prison where the elevator took us to a different floor from the one to which it always automatically took visitors. In a bare room with a few chairs and a folding table, I got to shake hands with Ronnie Frye for the first and only time. We sat in that room for a couple of hours and shot something like thirty minutes of tape, after deciding that it would be better for Ronnie to speak about what he felt rather than to read some prepared speech. What we had, by the end, was an interview: I asked questions and Ronnie answered. Then this undergrad and I went back to his dorm and edited it down to a few minutes of just Ronnie’s answers to send to Governor Easley. I have the cassette tape with both the three minute and the full thirty minute versions; it’s amazing and heart-breaking. Every time I watch it, I can’t believe I’m the kid in the video. Before we shut off the camera and left the prison, Ronnie caught me up in a bear hug, nearly lifting me completely off the ground. On the day of his death, I was expected to join his family for another contact visit. They would be there much of the day, leave for dinner when Ronnie got his last meal (he’d asked me to find a good place for a cheeseburger; as a vegetarian at the time, I’d asked around for a long time), and then return to spend some time with him in the evening. But when I arrived, early in the afternoon, prison officials told me that the visit was for family members and lawyers only; I might have been part of his legal team, but I would have to wait outside. I was stunned, but Ronnie was quick to adapt; he spent some of his precious time sending messages back and forth with me through his lawyers. I waited outside the prison for hours that day and, after dinner, I waited in a room near the parking lot that was slowly filling up with members of the media who were there to report on the execution. There had been some last-minute wrangling with prison officials and it seemed that I would be allowed to speak to Ronnie on the phone at some point that evening. The call came through late, after 11pm, when Ronnie’s family and attorneys had been escorted into a separate waiting room until it was time for the execution to proceed. He asked if I was alright; he said he was doing ok; he told me that his cheeseburger had been great; he said he hoped I could keep in touch with his family; he asked me to thank the people who were outside the prison gates holding a candlelight vigil; and he told me to keep working to change people’s minds about the death penalty. He said, “I love you, brother.” And then our time was up. Ronnie Frye’s death was meant to bring some measure of comfort to the victims of his crime, the family of Ralph Childress. Perhaps it did; I know Ronnie sincerely hoped that it would. But it also created another innocent, grieving family: Ronnie’s. As I have written a great many times on this blog over the past couple of years in one way or another, the death penalty is not a solution to the problem violence; it is violence. I know this from first-hand experience; it is not theoretical or abstract to me. One final note: Amazingly, and totally unbeknownst to me until I started writing this reflection, there’s an interview with Ronnie posted online as a resource for criminal justice students; it was recorded a little over a week before his execution. You can listen to it here. The term “foster father” is not at all the proper word to use in this situation and I use it only because there isn’t a term in existence to describe Ronnie’s relationship to Steve Ford. What happened is this: “While filling their car at a gas station, Steve and Cleo Ford heard that a Hickory woman was giving her children away. They met Carolyn Frye at a restaurant. She introduced 4-year-old Ronnie and his 5-year-old brother David. Then she handed her boys a bag of candy and announced that the Fords were their new mama and daddy. No papers were signed, no authorities involved. Ronnie Frye became Ronnie Ford.” There is a good deal more about Ronnie’s background here. An edited version of this blog post appears as the first in a monthly series of columns on the problem of justice in contemporary politics and pop culture that I will be writing for the Daily Nebraskan this semester. Anyone that can read this and still support the death penalty is beyond my comprehension.